73 years ago today began the largest amphibious landing in the history of the world as the Allies landed around 156,000 troops on the beaches of Normandy to attempt to breach the defenses of Fortress Europe and chase the Nazis out of France. The American forces landed numbered 73,000: 23,250 on Utah Beach, 34,250 on Omaha Beach, and 15,500 airborne troops. In the British and Canadian sector, 83,115 troops were landed (61,715 of them British): 24,970 on Gold Beach, 21,400 on Juno Beach, 28,845 on Sword Beach, and 7,900 airborne troops. 11,590 aircraft were available to support the landings. On D-Day, Allied aircraft flew 14,674 sorties, and 127 were lost. In the airborne landings on both flanks of the beaches, 2,395 aircraft and 867 gliders of the RAF and USAAF were used on D-Day. The Landings involved huge naval forces, including 6,939 vessels: 1,213 naval combat ships, 4,126 landing ships and landing craft, 736 ancillary craft and 864 merchant vessels. By the end of 11 June (D+5), 326,547 troops, 54,186 vehicles and 104,428 tons of supplies had been landed on the beaches. As well as the troops who landed in Normandy on D-Day, and those in supporting roles at sea and in the air, millions more men and women in the Allied countries were involved in the preparations for D-Day. They played thousands of different roles, both in the armed forces and as civilians. I have always felt a sense of great pride and appreciation for those brave men and women who fought and died on that great and terrible day in June 1944. 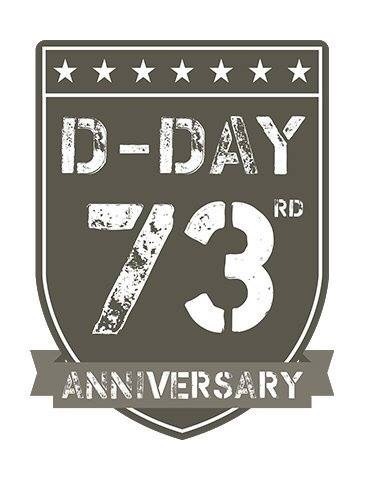 In this, the 73rd anniversary of this seminal event, let us all REMEMBER and HONOR their sacrifice! There are many great games out there that cover the Normandy Beach landings, which is not an easy thing to do in a game due to the sheer size and scope of the operation. One game that I have been researching for a while now, and finally purchased off the Geek Market on BGG, is Day of Days: The Invasion of Normandy 1944. This playable monster takes on the first 10 days of the invasion at company level and includes 15 different scenarios, ranging from the full campaign covering June 6 through June 15th, to mini campaigns focused on the American Beaches (Utah and Omaha) or the Commonwealth Beaches (Juno, Gold and Sword). 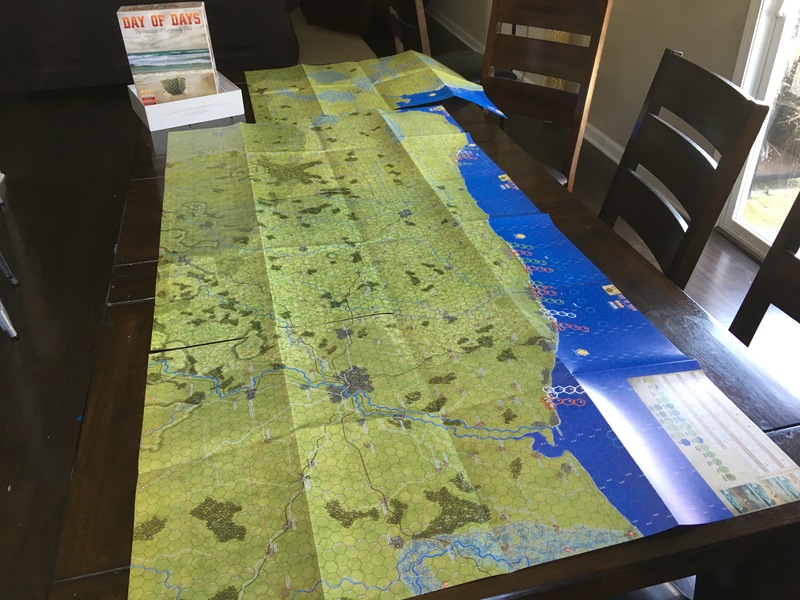 As you can see from the picture below, the game comes with four 22″ x 34″ maps that are absolutely massive in their scale and very attractive as well. I was pleasantly surprised that the maps laid out actually fit on my table. You will notice that the Cotentin Peninsula is hanging precariously off the edge of the table but that can be fixed by simply moving the other maps slightly to the left and it will then fit perfectly! There are 2,240 1/2″ counters (get that clipping hand ready) and various player aids and set up charts. The best part about this monster is that the rules are not overly complex. The Standard Combat System (SCS) is a somewhat old school approach to wargaming, which is good in many ways. What used to work will still work, but maybe it doesn’t have the chrome that more modern designs add. I have recently been playing more modern and sophisticated systems but I like a good game that hearkens back to the basics as it aids in getting the game to the table and actually results in me enjoying playing it rather than having to study the rules for a month before you dare to “dip your toe” in the water. Things like ZOCs, tracing supply, factor driven odds based CRTs, DRMs, TECs, exploitation, etc. are used and will be very familiar to many of you who decide to give this game a try. Overall, the rules are clean, understandable, and create an experience immersing the players in the intricacies of and feeling of WWII combat. Another great thing about the game is that it can be played by 2-8 players. So, if you are into World War II wargaming and have an entire weekend to blow sometime soon, call together 7 of your gaming buddies and give Day of Days a spin. You wont regret it! Check out our first entry in the series from May 24, 1942. The largest, 2 years too late, unnecessary amphibious landing in the history of the world? The event is of course interesting as a grail of modern Western history. Not so much for the war effort, that didn’t make any sense, but as an important brick to understand the politics behind it. The real story could work as game as well, and could be historically more educational: the rush to Berlin, whatever the cost, to stop the Soviets from getting more political influence. There’s a flavor of the dilemma in GMT “Triumph & Tragedy”, since the player of the Allies is forced to work quite hard to get the US involved soon enough to make any real difference. Nice though, when board games both supersede the reality, and makes more sense. My guess is that had the D-Day invasions failed, and the Allies were unable to get a foothold in Europe, the war would have drug on well into 1946 and beyond and could have had a very different outcome. I guess that the Allies would have had to have come up through Italy but the Soviets would have dominated the entirety of Europe if that had happened and you might be singing a different tune. That is what is great about historical gaming as you can actually relive the war and try different things to see their outcomes. Thanks for reading.